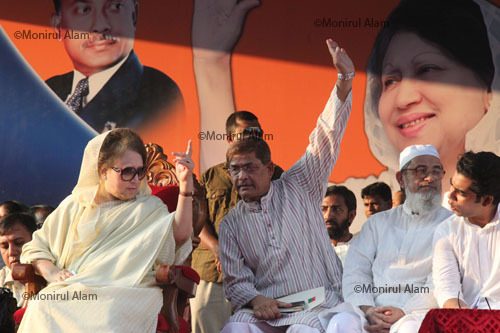 Bangladesh opposition leader and former prime minister Khaleda Zia, before her speak discuss with BNP secretary general Mirja Fakrul Islam, Zia speaks at a mass rally in Dhaka, Bangladesh, Tuesday, Sept. 27, 2011. 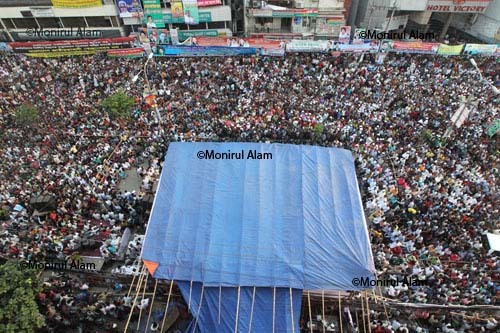 Tens of thousands of supporters from a four-party alliance led by Zia’s Bangladesh Nationalist Party joined the rally. Dhaka September 2011. Bangladesh Nationalist Party supporters gather for a mass rally in Dhaka, Bangladesh, Tuesday, Sept. 27, 2011.Tens of thousands of supporters from a four-party alliance led by Zia’s Bangladesh Nationalist Party joined the rally.Dhaka September 2011.